HAP-py New Year! Corks are a-popping here, because I'm very proud that since this blog's inception last summer, PlanetEsme has posted reviews and recommendations for over 130 books published in 2006, and at least as many "backlist" (older) titles. Below is a list of the new books (titles with an asterix are slotted to be reviewed in the coming weeks). I always love looking at the complete list of favorites because it is not only a reminder of what talent and beauty springs eternal from the pond, but a reminder of how possible it is to get a engaging and well-rounded base of knowledge using children's literature. If a child were to read every book on this list through the year...well, there's a potential for equal education within the pages, regardless of where a child lives or how much money a child's parent makes. Even after a night's worth of champagne, that is one sobering thought. So let us pour one last glass and raise it high in honor of libraries, parents and teachers who prioritize read-aloud, independent booksellers who work hard to get the best into our hands, and all who live the change they wish to see in the world through literacy. Chin-chin! What other awards would you give? Is there a book that made you cry the hardest? That had pictures of language that took your breath away? Is there an author or illustrator who bravely went in a new direction? Best parody? Brave new multicultural contributions? Least predictable? Most fun to read to somebody on your lap? Look over the list of last year's PlanetEsme picks below, and consider your own favorites...then give an award in the comments section below. Champagne monkey gif from house of the orange monkey. 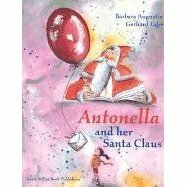 Here comes Santa Claus, and some holiday literature that shines as brightly as Christmas tree baubles! Just as it is fun to unwrap favorite ornaments come December, there is a special warm feeling in rediscovering these stories year after year. What are your favorites? Unwrap them here in our comments section...a good recommendation makes a great holiday gift! Scroogemacher is the miserly owner of a garment sweatshop in turn-of-the-century New York City. He forces his immigrant workers to work overtime on the last night of Hanukkah, and is visited by the Rabbis of Hanukkah Past, Present, and Future. Scroogemacher is transported to the time of Judah Maccabee, in the middle of the battle to reclaim the Temple, to the crowded tenements where his workers live, and finally, to see his nephew's possible futures based on his choices. So how did Jewish tradition hold up? The Rabbi of Hanukkah present is a female rabbi, and the text addresses Reform Judaism implicitly. Scroogemacher is outraged when, in the future, he is surrounded by Christmas decorations and music instead of his more familiar Jewish world, to which the rabbi replies, "What can I say? They have good decorations." Liberal sprinklings of Yiddish (a glossary is included) and humorous writing make this an original take on Dickens' work rather than a poor imitation. The artwork evokes a sort of Old World style that works well with the text. ...how many other Jewish children's books make an attempt to address the inescapability of Christmas and Christianity in American society while intelligently discussing the immigrant experience (the poignant tale of Scroogemacher's wife being sent back to the Old Country because of trachoma), Reform Judaism, the widening gap between Jewish as secular cultural identity and Judaism as religion, and workers' rights? How is (Jewish) Scroogemacher a worse influence than the greedy, stingy Christian personified by Scrooge? The important thing is that both find redemption and closer ties to their respective family and cultures. Dickens' Christmas Carol values seem based on tikkun olam, the Jewish commitment to healing the world. "Hanukkah, Shmanukkah" at least attempts to bridge the gap between the multitude of bright, colorful Christmas books for children and the lack of appropriate Jewish-themed books for older children. Starting with a universal holiday tale of redemption, it enfolds the warmth and light of Hanukkah, the power of love to transform, and the strength of Jewish tradition. A beautiful, thought-provoking read that brightened my Hanukkah. FOUR SIDES, EIGHT NIGHTS: A NEW SPIN ON HANUKKAH by Rebecca Tova Ben-Zvi, illustrated by Susanna Natti (Roaring Brook) For those visited by Hanukkah Harry instead of St. Nick, check out this nifty little volume that sheds a fresh new light on the holiday. While a bit tricky as a read-aloud, this is an original and exciting informational book, including a list of eight invaluable "Hanukkah Do's and Don'ts," suggestions for potato substitutions on latkes (pinto beans, hmmm! ), great ideas for what to bet while playing dreidel and plenty of history throughout. A generous peppering of black-and-white spot illustrations make this book extra festive and kid-friendly, and a lovely resource for teachers as well. What else, what else? SAM I AM by Ilene Cooper (Scholastic, 9 and up), powerful fiction about the cross-cultural and religious pulls of the season, Eric Kimmel's HERSHEL AND THE HANUKKAH GOBLINS (Holiday House, 7 and up) is a classic and beloved story that is enjoyed by all faiths, SAMMY SPIDER'S FIRST HANUKKAH by Sylvia A. Rouss, illustrated by Katherine Janus Kahn (Kar Ben, 3 and up) teaches colors as well, and works so nicely as a puppet show...there are so many more fine books than there are nights of Hanukkah, but no matter which you choose, they are sure to light a candle in the minds and hearts of our children. What are your reading delights for the festival of lights? Please share! 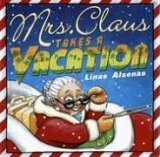 Santa may have a lot of frequent flyer miles, but in this book, it seems that the Mrs. has some catching up to do. 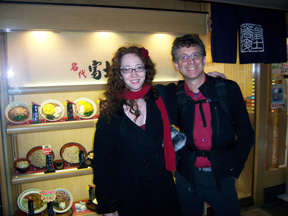 She packs her bag for a solo adventure, basking on beaches, getting in step with folkloric dancers, developing a taste for sushi . Meanwhile, in a drastic role-swap, it is Santa's turn to stay home with the cat, glumly decking the halls and baking the gingerbread cookies sans his better half. When the wife returns, however, Santa has planned one more special trip, and has tickets for two. Alfie P. Snorklepuss has serious doubts about the existence of Santa Claus. Armed with information garnered from his library's non-fiction section, he writes letters to editors, makes appearances on radio and television, and even advises readers on the World Wide Web to "wake up and smell the cookies!" Even armed with such authoritative research, Aflie has a hard time finding followers, and ripping his sister's stocking from the mantle makes his rhetoric none the more persuasive. Instead, she writes a letter to the big guy himself: "All I want for Christmas is a nicer big brother." Can a trip into the vortex that is Santa's magical sack make a leopard change his spots, or a boy change his candy cane stripes? I will never forget visiting The Exploratorium in San Francisco, a hands-on mecca for science buffs that had me writhing with desire to recreate just a little of it in a classroom if I could. And now, like a wish come true, we have this absolutely glorious and generous compendium that captures the Exploratorium's inimitable creative energy and commitment to both science education and the glorious cause of curiosity. This inspiring, eye-opening and engaging collection of experiments, descriptions and fun facts shows science is not only a subject but a life-force that exists everywhere (exemplified by the contents: Exploring Yourself, Exploring Interesting Places and Exploring Interesting Stuff). This combo-pack of straightforward information and scintillating activities meet the criteria for great hands-on science text: the experiments are shared step by step, with clear lists of everyday items needed and explanations for why things happen. Some of the experiments are very simple and perhaps familiar (vinegar eggs, anyone?) but they are in such quantity and variety there is something for everyone, and will be a boon to teachers with limited resources. Brimming with both cartoon illustrations and photographs, I think what kids will come away with is the ability to make more careful observations; ever notice the star inside an apple, or that the number of points on that apple's ovary is equal to the number of petals on the apple blossom? Who knew? Giselle and Coco come across an AWOL soldier in the woods, hungry and cold, without eyesight and with nothing upon his person but a small silver donkey. While the girls sneak food and blankets to their secret friend, he shares stories of donkeys, brave, steadfast and martyred: Ruth's donkey who carried Mary to Bethlehem; a folkloric porquoi tale in which a donkey saves the world from drought by bearing the suffering of others; and a tale that reflects the soldier's own experience in the trenches of the first World War. Can the girls give up the secret of the soldier in order to help him find his way across the channel, to the loving brother who awaits him? What does it really mean to be brave? After all, it has just recently won the National Book Award for "young people's literature". It is a compulsively readable book with a wholly original setting and premise, which I will preface by saying what I am about to say is a spoiler; it was an exquisite pleasure going into this book knowing nothing about it, and to have the situation reveal itself page by page, like a flower opening, and allowed me to revel in the extraordinary talent of the author whose impeccable pacing created the illusion that the plot was playing itself out in some alternate universe every time the binding was broken. So if you would rather just read it, please drop down to the next paragraph. But for those who prefer a synopsis: an African American boy has his identity as a slave revealed to him after years of being part of an elaborate experiment to see whether or not children with African roots have the same capacity to learn as Caucasian children. Once realizing his role in the community, it alters his ability to play that role, and when Octavian's mother is brutally sacrificed in the name of the experiment, his humanity forces him to flee though it jeopardizes the experiment, his own life, and the lives and perceptions of many others. Through Octavian's experiences, choices and actions, the reader explores the very nature of freedom and race. Set against the backdrop of the American Revolution, this narrative is newly potent in our modern time, when "freedom" is bandied about like some pop-psych buzzword. Based on real experiments and speculations carried on by the likes of the American Philosophical Society, the book bravely takes on the paradoxes of conflicts of interest, education, scientific inquiry, and the role of the almighty dollar, and the way our esoteric and philosophic notions manifest in real life, and more painfully, in the real lives of others. Reminiscent of Margarita Engle's THE POET SLAVE OF CUBA (Holt), this book pulls no punches. A major piece of literature, it is bound to be considered for many more prominent awards. "The men who raised me were lords of matter, and in the dim chambers I watched as they traced the spinning of bodies celestial in vast, iron courses, and bid sparks to dance upon their hands; they read the bodies of fish as if each dying trout or shad was a fresh Biblical Testment, the wet and twitching volume of a new-bord Pentateuch. They burned holes in the air, wrote poems of love, sucked the venom from sores, painted landscapes of gloom, and made metal sing; they dissected fire like newts." Beautiful writing. Nathaniel Hawthorne would be mighty proud. And now, representative of "young people's literature." The thing is, the young people I work with apply the very un-scientific "five finger test" to most texts wider than two thumbs, meaning they open a book up to a random page and try to decode in order to determine whether the book is a pleasure read (zero to one finger up for every unfamiliar word), whether they will need support (a dictionary or an adult from two to three fingers) or whether they need to hang on a few more years to fully get the author's meaning and intent, and honestly, most middle school kids I work with would need to grow a sixth finger for this baby. This does not in any way negate the value and sheer beauty of Anderson's literary feat, but it did confound me midway through, apart from the fact that Octavian himself is a teenager, why is this considered part of the genre of children's literature at all? Would Octavian have gotten lost in the myriad of adult fiction titles, had it been marketed that way? But, is it fair that the measure of a good book for children should be that it is fit for grown-ups? I read OCTAVIAN largely by accident; I do not generally review young adult literature, but this one snuck past the gates armed with the key, that is, a ton of "buzz" that this was a great contribution to children's literature, and I know it is great and I know it is literature, and I know it will land on a lot of shelves that can be reached by kids and, therefore, in a lot of hands of children, middle grade children, especially in a climate in which many five year olds are being read Harry Potter and a great deal of pride is being taken in the achievement of reading books that are intended for older audiences. So I have to ask. Why is this a book for children? Or do we simply need to differentiate between "young people" and "children"? I get confused, and so generally do not delve into "young adult" literature, because it frequently reads to me like adult literature with kids as protagonists. Classicly, then, is Jane Eyre young adult literature? Huckleberry Finn? Catcher in the Rye? Lord of the Flies? These are frequently read in high school. Is "young adult literature" a creative invention, much like the 20th century invention of the idea of adolesence, which is so confounding in and of itself? Can't adolsecent children generally read at the level of adults to some varying degree, and if so, why do they have a separate literature? I ask this not as an accusation, but rather as a query that I myself have not been able to answer satisfactorily. What I love about Cynthia Leitich Smith's answer is the acknowledgement of the adult level, and the criteria of coming-of-age, both of which suits OCTAVIAN NOTHING. "It is difficult for me to formulate a strict list of rules that will differentiate young adult literature from adult literature. There are certainly going to be exceptions to every rule. But it is quite easy for me to read a book and characterize it as either a young adult book or an adult book. Why? A portion of this 'knowing it when you see it' has to do with my own adolescent sensibilities and the balance results from my having a whole lot of experience with what works for teens. When I read a book and think, 'Gosh, remember that quirky student in 2001 who was a really sophisticated American history nut? He would have loved this book!' then I know I'm dealing with an adult book. When I finish a book and want to immediately booktalk it to all my high school reading buddies (who still come back to the middle school to borrow from our stash) or to con my wife Shari into letting me read it aloud to her current eighth grade English students, then I know it's real YA literature. It means the world to me that teen readers see me as someone who knows what books are 'cool' and who knows what he is talking about. I don't believe that I underestimate the sophistication of teens or their ability to be patient with a book when necessary. But I think there are light years between real YA literature and some of what is published as YA literature today but is full of adult sensibility and characters." I guess I get a little grumpy when the small amount of recogniztion given to children's literature is given to works so clearly meant for people on the cusp of adulthood; I am appreciative of the Printz award for that reason, and I hope the National Book Award follows suit and gives "props" to book creators for both young adults and children. I still think young adult literature it is a genre apart from children's literature on the whole, a genre on its own. Though I personally enjoy some young adult literature (Laurie Halse Anderson, for example), what I miss in so much of it, I think, is the author's intent to give a gift to a child through the work...though I guess this could also be said increasingly of picture books, as they become graphic art books for adult appreciation instead of books that kids actually enjoy. When I read, I wonder, does the author, at any point, imagine the audience? In order to write great literature, I don't think you need to imagine the audience, you just need to tell a great story in the best language and most honest way you know how; this seems to be what goes on in both good YA and adult literature. But in order to write great children's literature, I do think it comes out better when the audience is considered. Not that literature should be dumbed down to one or two fingers (William Steig certainly didn't), but I do deeply appreciate and immediately recognize an excellent children's author's intent to share something with a particular audience: a child, to whom the world is newer, and to whom impressions press upon the senses like a kiss or a whisper, or bruise like a thumb against an apple skin. These books are not always clean or safe or perfect, but, well, how do I put it? Have you ever crossed a street while holding someone's hand? Have you ever crossed a street without holding someone's hand, just standing next to them? There you go. Shortly after finishing OCTAVIAN NOTHING, I came across an old, out of print copy of WOLF STORY by William McCleery, in which a beleaguered father strives to entertain his son with stories made up off the top of his head. As I read it, I knew which lines would make the children laugh if I were to read it aloud. I knew the pleasure the children would have, looking at each other knowingly, sharing in the joke that the boy had over on his dad: the understanding of the quality that every story needed to be good, which the little boy in the story knew instinctually, and which the father needed to be constantly reminded. Snow day today!!! That's right, school was cancelled. 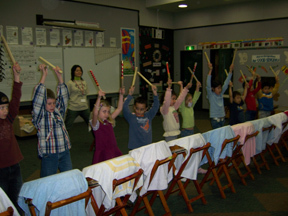 Thousands of children were jumping up and down, yanking on snowpants and ransacking closets in search of sleds...meanwhile, hundreds of teachers were readjusting their teddy bears in the crooks of their arms and hunkering down for another couple of hours of sleep as the white fluff collected higher and higher in the corners of the windows. Honestly, a snow day is indescribable bliss, nature's mental health day, and one of the greatest occupational perks ever known to man or woman. 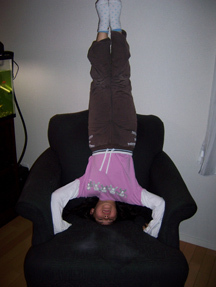 Reason enough to go into teaching...though I must say, the kids are pretty fun, too! 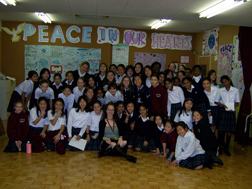 The International Schools, which I knew very little about until I accepted this invitation. I thought they were military schools, but in fact they were a network of private schools for children whose parents are primarily in business or otherwise work abroad. 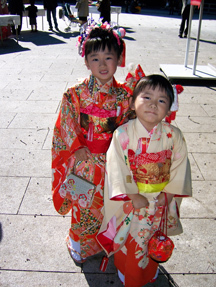 There are no Japanese children in attendance, as they must go to the national schools so that they can learn enough Kanji to succeed in the culture at large. 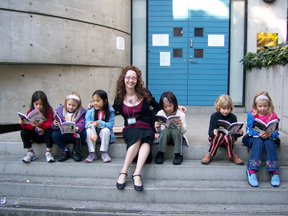 The schools I visited were progressive, diverse and full of happy children (why not? They get to bang on drums at school! How rock and roll is that!) and OUTSTANDING readers....here are some cuties who are all carried away by the adventures of Jenni Holm's BABYMOUSE series. Good taste, girls! 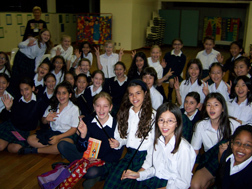 The librarians, teachers and administrators were warm and knowledgable at every stop. My family for the most part stayed with Wouter, a Belgian librarian and all-around fun guy, and his lovely, welcoming wife and perfect baby son. Wouter's library was like an idea factory, with different funny hats hanging everywhere. 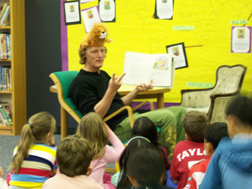 Wouter explained that these were his "thinking caps," and children helped choose just the right hat he should wear before storytime, so he would be able to translate from Finnish into English. I put one on, but I still could not speak Finnish. Everywhere, people treated us so generously, and were so thoughtful. One school had a royal tempura lunch biked in, another librarian had five different pastries to choose from for breakfast. One headmistress I stayed with had two little girls, and invited a boy to sleep over so my son would have someone to play with. Another librarian and her young daughter took us out to a supper that was so beautiful, my husband and I were up late into the night, replaying each dish over in our minds...and we have been replaying the jokes at the table over long after that! 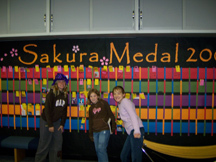 At every school, I met with children I will not soon forget, and educators in environments where achievement is a top priority, but were fiercely committed to giving children a wide variety of material to read for enjoyment so that they might create lifelong readers, not just test-takers. I am not naming names here for internet safety reasons, but I'll tell you, I've got a lot of thank-you notes to write! The food. I love good, beautiful food so much (maybe second to books!) and the Japanese cuisine was definitely a highlight of my trip. 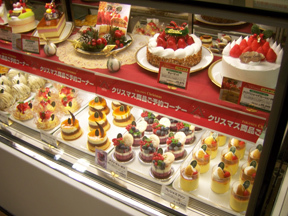 In the basements of the department stores are prepared food counters that go on for a city block. The most beautiful pastries are nestled into little boxes with foil tissue, and individual freezer packets to keep the cakes the right temperature while in transit. This care is strangely countered with an excess of mayonnaise on pretty much everything else, and tuna, shrimp and egg salad sandwiches for sale almost everywhere you go. They cannot possibly ALL be properly refrigerated, can they? Still, I took my chances and they were delicious. But deep-fried dough balls with a little dead octopus inside? No no no no no. I waited for the dark day of food poisoning, but was apparently looked after by my Guardian Foodie Angel. 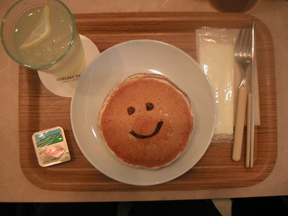 Perhaps the friendliest meal of all were the pancakes that actually smiled back at us at a local café. Talk about a good morning! SCBWI Japan. The fledgling Tokyo chapter of the Society of Children's Writers and Illustrators very kindly rolled out the welcome mat to me, and we enjoyed charming company and one of the best meals of our whole stay in the marvelous restaurant owned by the family of Naomi Kojima. She is the author of the great new book hot off of the presses, SINGING SHIJIMI CLAMS, which brings to mind a kinder, gentler version of Lewis Carroll's "Walrus and the Carpenter," featuring a not-wicked-witch who befriends her supper; a strong addition to multicultural collections. Also pictured with me are young adult novelist Holly Thompson, illustrator John Shelley (who has a pretty wonderful book coming out next year, he showed me advance proofs) and not pictured is the multi-talented Gerri Sorrells, who, along with her husband, took the time to get us on the right track, literally, in the subway. 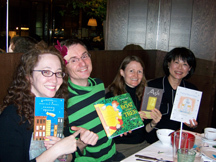 To find out more about these and other international children's literature talents, check out SCBWI Japan. I must say, I love being a part of this professional organization; it's like having a caring, enthusiastic family away from home, wherever I go. People-watching. The women in Japan seem, for the most part, very slim and gorgeous, and probably the most fashionable I've seen anywhere in the world. Their style is really stunning and imaginative, with faboo three inch heels, plaids and flowers and fearless uses of color, like artists; feathers, Chanel bags, haircuts like women in shampoo commercials. Some of the more splashy young people dress like super-ultra-hip crazy rave DJ's who scream out a la Kurt Cobain (kids hold band practice on the sidewalk, amps and all) and spiky-haired goth girls whose witchy-poo look make them seem as if they just stepped off of the pages of DIARY OF A FAIRY GODMOTHER, except their gracious bowing belies their true natures. Apart from these uber-mod tesselations, the men in suits, women in skirts, children in Prussian-influenced school uniforms (where can I get one of those sailor suits?) and general use of hats make everything seem like another time period altogether. Which means, shopping's off. The clothes are cut for size-2 fashion models, not for nice midwestern "I'll have a cheeseburger-with-thousand-island-dressing" gals like me. Though how do the women fit these clothes, when there are potato salad sandwiches for sale everywhere, and if the food stops moving long enough, it will be breaded and fried (and covered with mayonnaise)? The thinness is very mysterious. Also, lots of soft-spoken women. Voices oh so very gentle and low, like a breeze through the maples. Huh? Wha? Excuse me? I started to go a little crazy, like I was living the "puffy shirt" episode of Seinfeld. Ooo, when those gorgeous girls decide to speak up, watch out, world! Sight-seeing. This was mostly a working trip for me, visiting schools almost every day, but what better sight can there be than smiling children? 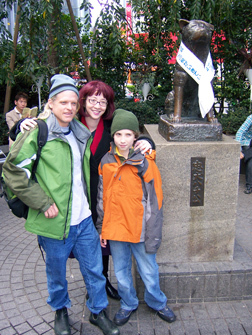 All the same, I was excited to have a little time to make two memorable visits: one, to the statue of Hachiko, the faithful dog who walked his master to and from the train station every day, and when the owner died at work, the dog continued to come for years and years. 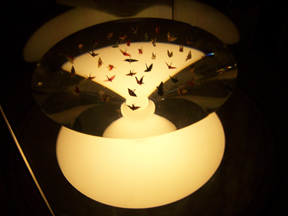 Also took the Shinkansen, or bullet train, to the Peace Museum in Hiroshima, where I was able to see the real paper cranes of Sadako, who folded them by the thousands in an act of hope that she would survive the radiation poisoning that ravaged her body after the dropping of the Atomic Bomb. I had read about the cranes, but had no idea how tiny they really were, some of them folded with the tips of needles. In the photo below, they are lit from beneath. The museum was memorable and stirring; I wished that everyone could see it, especially those in military training, as it gives a resonating understanding of the causes and effects of war. I liked what conductor/composer Leonard Bernstein wrote in the guest book: "Fewer words! More actions!" 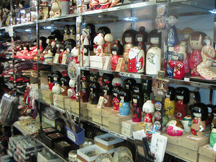 On the way back to Tokyo, we stopped at an amazing handicraft store in Kyoto, where we saw breathtaking modern and antique woodcut poster art (a special delight for my husband, who is an artist in a similar medium) and plenty of dolls. Hours slipped away, staring at the beautiful work and choosing souvenirs (I couldn't resist a couple of bells to use as a call to storytime!). On another Sunday, I was very psyched to be at a local shrine for Shichi-go-san, a holiday in which gratitude for children's health at the ages of 3, 5 and 7 is commemorated. Little children were really decked out in full traditional costume to celebrate their special day , and got colorful goody bags as souvenirs. Parents and grandparents were bursting with pride, and puppet shows and dramatic performances abounded along the path. What a merry time! The endless faux pas. Like the main character in my new book I try to be a polite person, and like the character in the book, I often fail. In Tokyo, it is impolite to eat while you walk or to put one's hands in one's pockets or cross one's arms. Three things I didn't realize I do all the time until I couldn't do them anymore. The trains. I was hopeless when it came to taking the trains and busses. 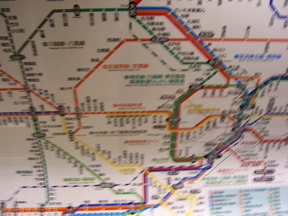 The splayed, colored, interweaving lines of the subway system reminded me of certain illustrations of the nervous system in my high school biology textbooks. Yes, some of the words are in English, but when the words are the likes of Kichijoji and Shibuya, well...new territory for Auntie Esme, folks. Wouter was especially patient about drawing maps and arranging liasons. There was a picture in Richard Scarry's now out-of-print BUSY, BUSY WORLD, in which a beetle goes into a Japanese subway train with a big fat round sausage and comes out with a long thin noodle-like sausage. When I was a kid, I thought that was hilarious. But Richard Scarry was not kidding. Imagine the most crowded subway car you possibly can. Then add thirty people. "Pushmen" come with big flat paddles shove in the people who are still hanging out, grappling at the edges of the doors. Sweet Mother. Once inside, no talking, please, and no looking at each other. Just sleeping, playing games on cell phones and checking out the nudie cuties in a manga digest. 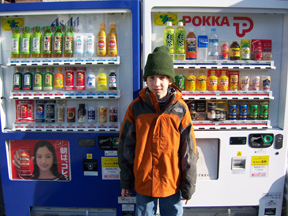 Overall, though, a toast to Tokyo, using any of the fine beverages in the numerous dispensers all over the city (green tea, anyone?)! Sayonara is such sweet sorrow, but I'm glad to be back in the states and look forward to beating this jet lag and being your holiday shopping helper, recommending the best new books and old favorites in the days to come.